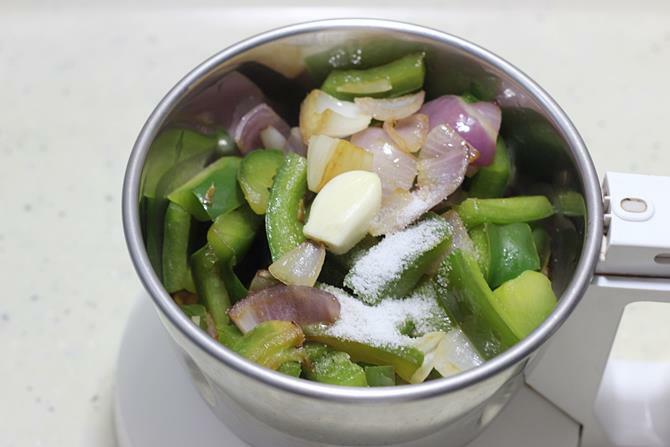 Capsicum chutney recipe – Capsicums are rich in vitamin A and C and many other minerals. I try to include them in dishes where ever possible in fried rice, biryani, curry and even in stir fry recipes. 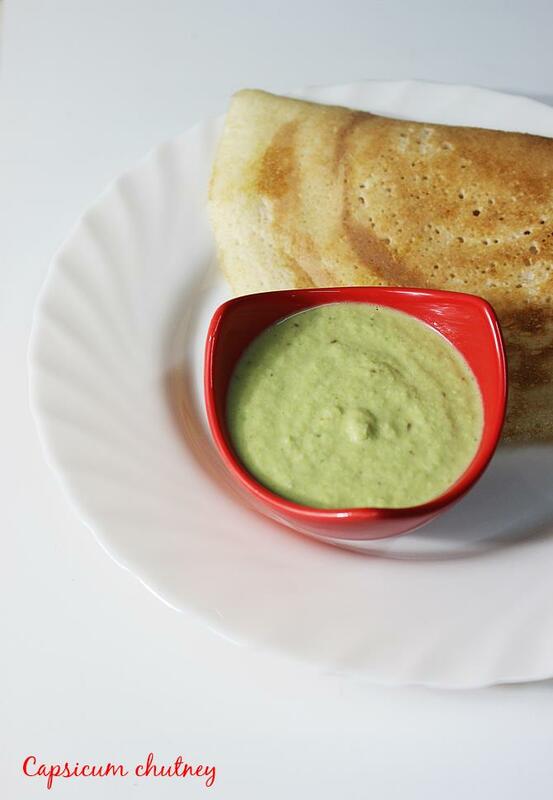 I prefer to make vegetable or leafy greens chutney to accompany our south Indian breakfast idli, dosa, pongal or any other dish. That’s one of the easiest ways to include vegetables in our breakfast. 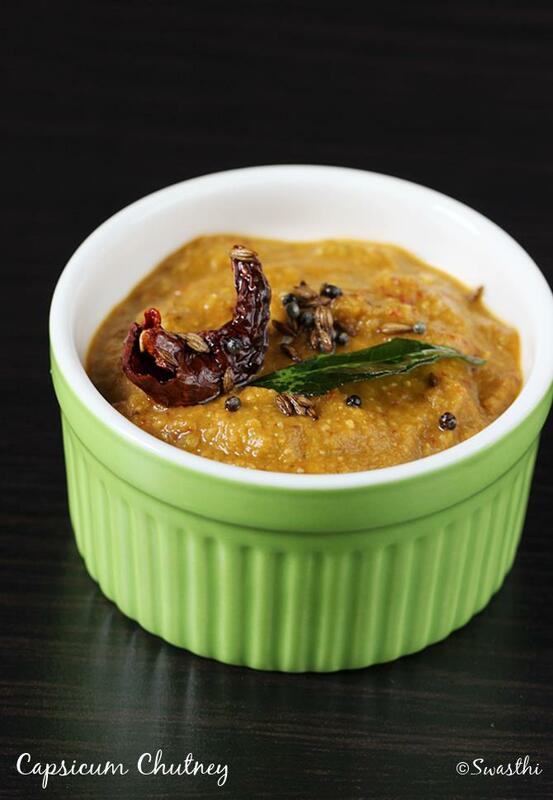 I am sharing 2 capsicum chutney recipes on this post. I make these capsicum chutney for idli, dosa, pongal, or pesarattu , We don’t mind even enjoying this with sandwiches, vegetable spring rolls or even with paratha. Using chana dal is a better option than fried gram for folks on low glycemic and low carbs diet. Fried gram saves a bit of frying time which otherwise the chana dal has to be fried and cooled. My breakfast chutney recipes are mostly no garlic or garlic is sauted well. Due to its pungent smell and the hubby insists I don’t use it when made to accompany the breakfast. You can use ginger or garlic to suit your taste. You can even use few pudina or coriander leaves. This chutney needs no tempering / thalimpu , if you wish you can do it with basic ingredients like oil, mustard, cumin, red chilies and dals. 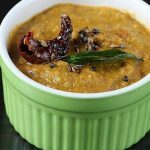 You can also make this capsicum chutney like a pachadi or thogayal to serve with plain rice and ghee. Do not add water and just blend all the ingredients together. 1 tsp tamarind paste or lemon juice or 1 medium sized tomato chopped. 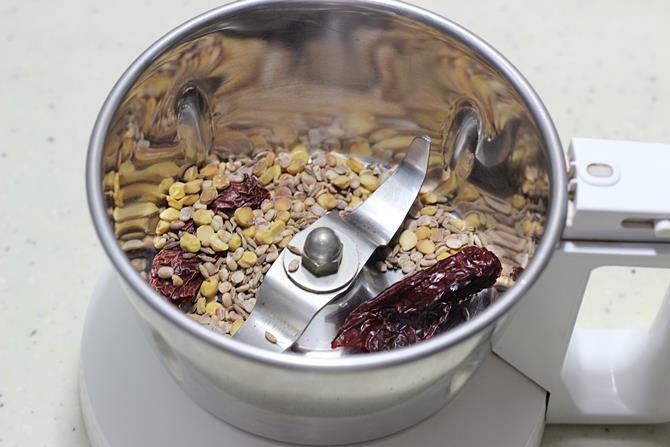 Dry roast urad dal, chana dal and red chili until golden. Add cumin and toss. Set these aside to cool. 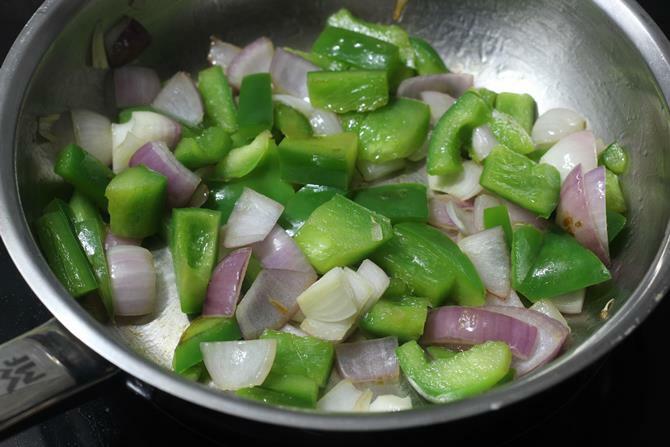 Add oil to the pan and saute onions, garlic and capsicum until the raw smell of capsicums goes away completely. If the capsicum is not sauteed well, the flavor of the chutney will not be good. If using tomatoes, you can add it now and cook till the tomatoes turn mushy. Powder the dals first and then add capsicum, onions, tomatoes or tamarind. Blend until smooth. If needed add 2 tbsps of water. Taste and adjust salt and sour tastes. Heat oil in a pan, add mustard when it splutters add red chili, curry leaves and hing. Pour this to the capsicum chutney. Fry chana dal to golden set this aside to cool, skip this step if using fried gram. Fry chilies, if using green chilies, you can use raw. Fry capsicums in the same pan till slightly soft, do not overcook or over fry. Once you begin to smell the capsicums well, switch off. Add cumin to the hot capsicum. Cool this completely. 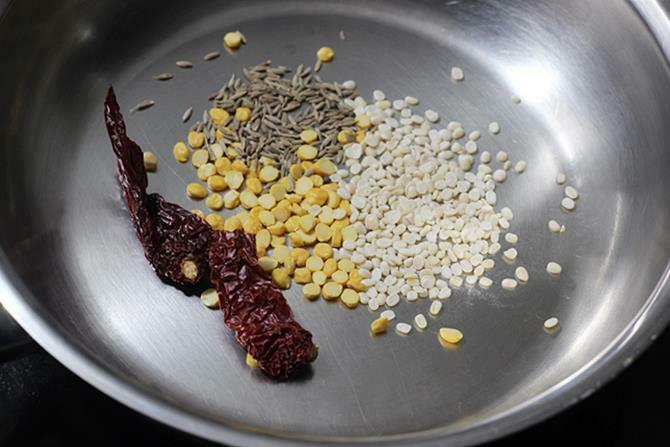 If desired it can be tempered with mustard, cumin, hing, red chilies and curry leaves. 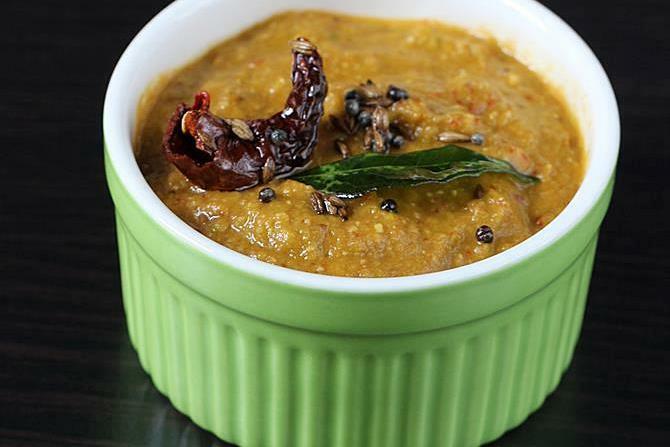 Serve capsicum chutney as desired. 1. Dry roast dals and red chilis. When the dals turn golden, then add cumin. Toss it for a minute. 2. Cool and add them to a blender jar. 3. Add oil to the pan and saute onions, capsicum and garlic. Saute till the raw smell of the capsicums goes away completely. If using tomatoes, you can add them now and saute till they turn mushy. 4. Powder the dals first, then add the cooled capsicums and onions. Add tamarind or lemon juice and salt. 5. Make smooth chutney. Adjust salt as needed. 6. Heat oil in a pan and allow mustard to splutter. Add red chilli and curry leaves. Switch off, add hing and pour it over the capsicum chutney. Tried Ur chutney today, it came out very well, everyone appreciated, thanks a lot..
Will try all ur recepies nw.. 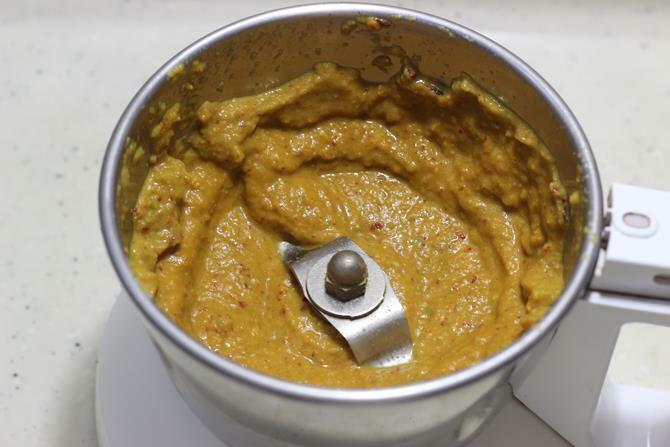 I made this chutney today…along with your Wheat Dosa.. I tried your capsicum chutney recipe ,it came out amazing..Thanks for your recipe..I will try your other recipes also. Happy to know you liked the chutney. Thanks for the feedback and do try other recipes. very nice recipes and tried egg cuury today and came out very tasty and I pinned many of them and going to try others too. Chutney with capsicum?? totally new to me…going to try this tomorrow for breakfast…BTW your pic is awesome!